"The underreported story of the Cold War is that the United States succeeded in achieving many of its objectives in the Middle East," argue Ray Takeyh, senior fellow for Middle Eastern studies at the Council on Foreign Relations, and Steven Simon, visiting scholar at Dartmouth College. Cutting against conventional wisdom, the authors shed new light on the makings of the modern Middle East and draw lessons for U.S. strategy today. 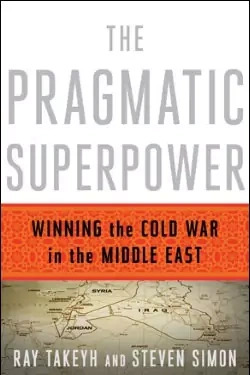 In their new book, The Pragmatic Superpower: Winning the Cold War in the Middle East, the authors examine how Washington handled ten crises between 1946 and 1991, any of which could have provoked a wider conflict, threatened U.S. interests and allies, or brought the superpowers into direct confrontation. Using adroit diplomacy and hardheaded pragmatism, Washington prevented Soviet infiltration of the region and shrewdly navigated the rise of Arab nationalism, the Arab-Israeli wars, and the Iranian revolution. "As it entered the region, the United States' principal objective was to ensure stability," stress Takeyh and Simon. "A stable order in the Middle East could resist Soviet pressure and maintain a free flow of oil. And politicians tied to the West were best positioned and more likely to make peace with Israel." The Arab Spring, Iran's nuclear ambitions, and the Syrian civil war—among other contemporary conflicts—have deep roots in the Middle East's postwar emergence from colonialism. The authors conclude, "Amid the anarchic conditions of the twenty-first century, characterized by a new normal of military intervention, regime change, and vast social engineering projects, there is an urgent need to look back at a period when the United States got it right, recognizing that the domestic and international order in which Washington succeeded is inexorably receding." Takeyh and Simon, both preeminent scholars of the Middle East, have written a lively and provocative challenge to conventional wisdom about U.S. policy toward this tumultuous region during the Cold War. They argue that by excluding the Soviet Union, supporting conservative Arab allies, and exploiting the emergence of Israel as a major power, American policymakers secured their Cold War interests in the region. Their study is a must-read for policymakers and students of American policy, a major contribution to our ongoing debate about the role of the United States in the Middle East. A fascinating tale of the United States' tangled involvement in the Middle East, told by two of Washington's sharpest and most seasoned regional experts. Eerie echoes of today's headlines resound throughout this gripping look at the history of a crucial theater of the Cold War. Faulkner said the past is never dead; in fact, it's not even past. Nowhere is this truer than the Middle East, and Takeyh and Simon's excellent book shows you why. A singular take on U.S. foreign policy in the Middle East.